Once women become moms, they actively seek out advice from other moms to help them stay sane and stay ahead of the curve when it comes to all kinds of topics related to parenthood. As part of the POPSUGAR Insights #Momstamina study, we wanted to better understand how moms are spending their "me time" and their motivations for sharing content socially with others. Overall, moms seek out content that entertains, informs, and inspires. And when moms do find themselves with a few minutes to themselves, they're often spending that time engaging with lifestyle content. From food (62%), to shopping for apparel and accessories (46%), to beauty (38%), moms are spending their precious free time seeking to discover something new. And because moms are never truly off the clock, 37% of moms even check out parenting content during their "me time." Socially, Facebook is the dominant platform for moms. Nearly 9 in 10 moms (88%) regularly use Facebook. 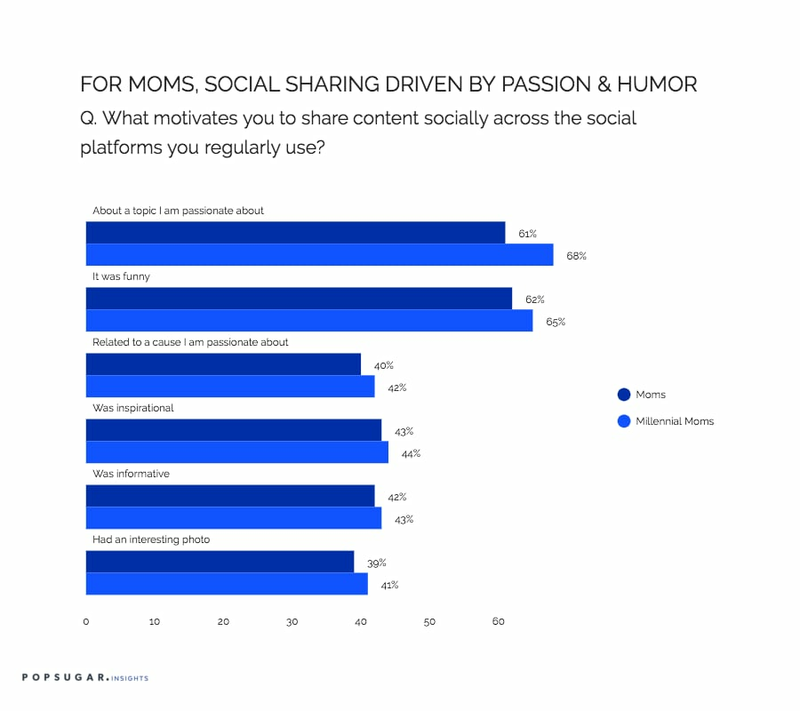 When moms find themselves inspired to take action and share content with their friends and family and other moms, reasons they do so include because they found the content funny (62%), because it's about a topic they are passionate about (61%), and because they find the content to be inspirational (43%). Moms are also inspired to share because they discover content that is informative (41%), when content has an interesting photo (39%), or when content was originally posted by a friend or family member (30%). Millennial moms are more likely than moms overall to be driven to socially share content when it's about a topic they are passionate about (68%), when it's funny (65%) and has an interesting photo (41%). Brands should consider how the messages that they want to share align with these motivations for sharing and create valuable native content that is worthy of sharing. Understanding why moms share can help them develop content that dramatically expands their potential reach.